I am an Indian American born in New Delhi and raised in New Jersey. My sister has struggled with schizophrenia and a co-occurring diagnosis of bipolar disorder for most of her adult life. It has been a turbulent roller coaster ride – from having to deal with stigma to her transition to independence. 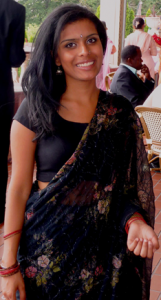 Being of South Asian descent, where mental illness is not spoken about openly, it was difficult for my family to comprehend why this was happening, what is to be done and how to cope with all this. As a child growing up I did not understand what was going on. As I grew up, my family and I had conversations that helped clarify everything. Since then I decided to be in a profession which would help eradicate the harsh judgment which came to anyone with mental illness. I graduated with my MSW in 2012 and have been working in mental health. I ultimately want to go back to New Delhi and start an organization dedicated to helping individuals with mental health disorders. Travelling back and forth from India and New Jersey, living in both environments, I realized a lot of people need to have their eyes opened to the reality of how difficult it is to live with stigma. I want to build awareness and open up the doors to accurate education on what mental illness is, how to understand it, deal with it and help each other rather than isolating those who need the most support. I was very happy to find a resource like SAMHAJ, a South Asian family outreach program of NAMI NJ . My sister was attending the SAMHAJ support groups, and I attended a few with her and realized what an amazing group it was. I now volunteer as a support group facilitator and also help with outreach and other tasks for SAMHAJ and NAMI NJ. SAMHAJ’s work in enhancing mental health awareness and bringing the community together has truly changed my outlook. Even though we are a small group of individuals and SAMHAJ is a growing entity it has helped change so many lives. Whenever the support group meetings are held I am excited to see how the group members enhance each other’s lives and support each other. It truly makes me happy and at peace when I see that we are making such a difference in people’s lives through support, understanding their struggles and enriching their lives with positive assurance and support. My mother, sister and I are very fortunate to be a part of such a great support system. I truly do believe as a community of determined and caring people we can change the outlook people have on what mental illness is and how it can change a family’s and the individuals life. With support and positivity, stability is produced and that is what SAMHAJ offers – a strong foundation. I urge you to get to know what SAMHAJ is all about and give us the chance to truly grow with your support. SAMHAJ gives a voice to the struggles of South Asians with mental illness. If you identify with these struggles, or are moved by the hope and vision for a community free of stigma, I hope you will support SAMHAJ today and beyond.